It was said in ancient Rome that the way to appease the populace was to give them bread and circuses. This of course was in the context of an authoritarian system where dissent was not tolerated and there was no concept of "human rights". In modern usage, the phrase is taken to describe a populace that no longer values civic virtues and the public life. And if the bread becomes more meagre, then of course the circuses become more important. So as it is announced today that disposable income of UK citizens, on average, is at its lowest now since 2003 (quite an indictment of the economic performance of the country under two contrasting governments), the fact is somewhat lost in the razzmatazz around that greatest circus of all taking place in East London and elsewhere. Everybody feels so great about that, don't they? They more or less have to, don't they? Nobody really was allowed not to like the Danny Boyle spectacular, you were putting yourself in the company of a rather weird right-wing Tory and pretty much no-one else if you did not. But while Britain's turbulent history of activism and political dissent was being celebrated in the ceremony and on TV, while the Suffragettes, who got arrested and mistreated for their fight for equality were remembered, strangely enough, right outside the Olympic arena, the great circus, people fighting for a equality and fair treatment in a different field were being arrested and mistreated by the police, pepper-sprayed and kettled. If a novelist imagining a dystopic sci-fi future Britain had composed the scene, he would have been doing a pretty good job. It was probably inevitable that the Critical Mass bike ride on the night of the opening of the Games would end in trouble. Not because those involved wanted trouble; far from it, but because there was simply "no room" on the streets of Olympic London, both in a physical and a spiritual sense, for an event like this on that night. The police could not let it it happen. They could not allow the possibility of an area of streets close to the Olympic Park being gridlocked at that time. On any other occasion, yes, they could grudgingly live with it, but not on this occasion. Yet Critical Mass is not a beast which can be controlled, for it has no organisation, no plan and no leader. It is merely a tradition, the kind of tradition which might otherwise have been celebrated in a show like Boyle's opening ceremony: a tradition of gathering of people on bikes at a particular time, the evening of the last Friday of the month, in a particular place, on the South Bank of the Thames, for a particular purpose, a meander round streets on a route determined on a whim by those at the front of the group, the objective being to fill the streets with a slow-moving cavalcade of bicycles in which riders feel safe and freed, for the moment, from the otherwise ever-present threat of dangerous interaction with motor vehicles: a critical mass of bikes. It has often been said in the last few days that Critical Mass in not a protest, it is just a ride or an event, but in fact it shares characteristics of both protest and festival. It exists because the normal conditions for cycling on the streets of London (and other cities around the world where Critical Masses take place) are no good at all. There is no right enforced for cyclists to proceed safely, with fair and civilised treatment, on our roads as they stand. Critical Mass is definitely a kind of protest against, and a reaction to, that fact. It is a protest demanding a different order in transport and street hierarchy as much as the Suffereagettes were a protest demanding a different hierarchy in sexual politics. There is no Critical Mass in the Netherlands, where cycling is treated as a first-class form of transport, prioritised equitably with other modes. The police tried to ban Critical Mass from the north side of the Thames, and they tried to prevent it from invading the sacred space of the Olympic Lanes, both of which conditions were inconsistent with the freeform nature of the event. 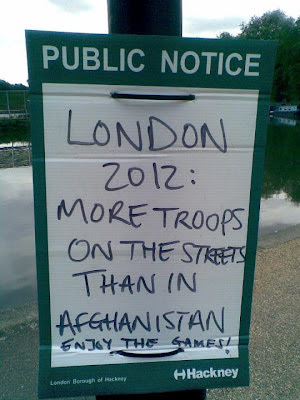 There was a fundamental discordancy between the spirit of Critical Mass and the nature of Olympic Lockdown London. Eventually, after considerable unpleasantness, the police broke up the mass and herded the rump of it into a small street in Bow, where the participants were kettled, and in the end 182 of them were arrested and taken away in buses. Of this 182, only three have been charged with offences. The experience of one of those not charged, but held overnight in a cell, has been written up on opendemocracy.net. It makes a salutary read. You have to keep reminding yourself that the place where all this took place was not Burma, but London. I have no relationship with Critical Mass. I have been on it, twice I think in two decades, in order to find out what goes on, and I am neither a fan of it not a detractor. I seek to understand. As with the suffragette movement, it seems to me there is a clear way for the government to deal with the recurring problem that Critical Mass poses, and that is to understand what the problem is that it is a reaction to, and to address that problem, by starting to correct the lack of resources and rights, the fundamental power imbalance, between those who choose to use the streets using their legs and using human-powered machinery, and those who choose to use them in motor vehicles. It's not a thing that will be achieved in one legislative stroke, as was possible with Votes for Women. It will be a policy process. It has not started yet. Until it does, our cities will have to accommodate events like Critical Mass. There is a third alternative, which is that the right to peaceful protest on the streets will be stamped out in the UK. We seem to have gone a long way down that road already. People have a right to protest and it is an incredibly important part of our democracy … What people do not have the right to do is to hold a protest that stops other people from exercising their own rights to go about their business – that means athletes who have trained for years for their chance in a lifetime to compete, millions of ticketholders from seeing the world's greatest sporting event, and everyone else in London who wants to get around. That of course is an argument that could effectively be used to end all street protest, at any time. A right is not a right if it can be taken away whenever it has inconvenient consequences for some people. It is a method of oppression to try to forcibly prevent protest rather than listening to what the protesters want and adjusting policy accordingly, which would, if not bring an end to all such protests, reduce their support and nuisance value. Like the Roman rulers criticised by Juvenal, the rulers of modern Britain seek to distract attention from the decayed and disfunctional states of both our democracy and our environment by giving us entertainment and spectacle, while shoring up the privileges of an elite. The Roman Empire did not fall for 300 years after Juvenal wrote of panem et circenses: it's a policy that can work, for the emperors at least, for a long time. It's a Big Mac and an Olympic ticket now – never mind that all the expediently-made promises about the green and socially-responsible Olympics were all broken and forgotten. A state run in this way, is however, quite inefficient, and, as the declining disposable income of citizens attests, I expect a continuing slow economic decline for a UK that neither modernises its political culture and structures, nor embraces dissent and alternative views, nor tackles significant social inequalities, nor learns to live in harmony with the natural environment, nor allows safe space in its cities for children and old people and others on bikes. 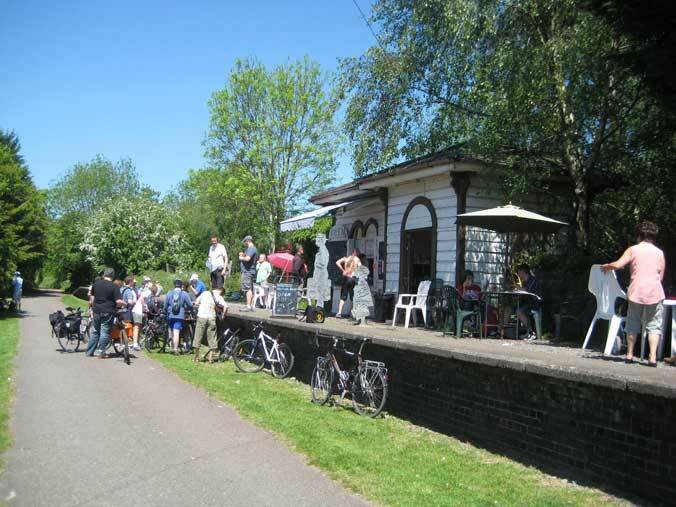 There is a petition to sign demanding justice for the Critical Mass 182, and the campaign against the closure of the Lea towpath goes on. And there's a good outsiders' view of what is going on in London from, of all people, the Americans, on NBC News. 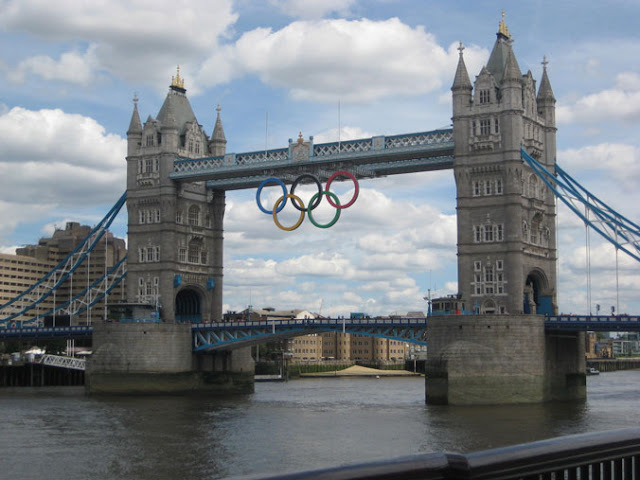 There can have been few bigger lies uttered in recent history than the claim that the 2012 London Olympics would be the "Greenest Olympics ever". For "ever" is a long time, and must include the ancient Olympics, where the athletes wore no clothes, so that sounds pretty green. Even if you go back no further than the last Olympics held in London, the 1948 games at Wembley, you realise that it must have been a lot "greener" then. For nothing at all was built for the 1948 games. The stadium was already there, built for the British Empire Exhibition of 1924–5. There was no athletes' village; the athletes were put up in the homes of local people, as the Brent Magazine (p27) recently recalled. And I bet a heck of a lot more people cycled to Wembley to spectate at that games than will cycle to Stratford for this one. I notice now a consensus emerging in the printed and on-line media across the political spectrum – an unusual phenomenon – not just the left-wing Twitterati – with articles in places as diverse as the Mail, the Spectator, and Guardian, all tending towards a distaste for what the London Olympics has been allowed to become in so many ways. An event in London where you can't buy chips or British beer. An even into which you are not allowed to bring your sandwiches. An even defended by rocket launchers sited on peoples' homes and unmanned drones flying overhead. Security paranoia, closure of rights of way. An event you can't cycle to. An event that grants a few bigwigs and lackeys and hangers-on exclusive rights to lanes on the road network, to the disadvantage of bus and taxi users and positive endangerment of cyclists. Lockdown London. Privatised London. A takeover by big business interests and the private security industry. All as far as you can possibly get from the supposed Olympic ideals. Most disturbing of all: the breaches of British traditions of justice and free speech and overturning of basic human rights. The unique rights given to the IOC and sponsors to enforce against unauthorised use of not only symbols but common words in the English language. 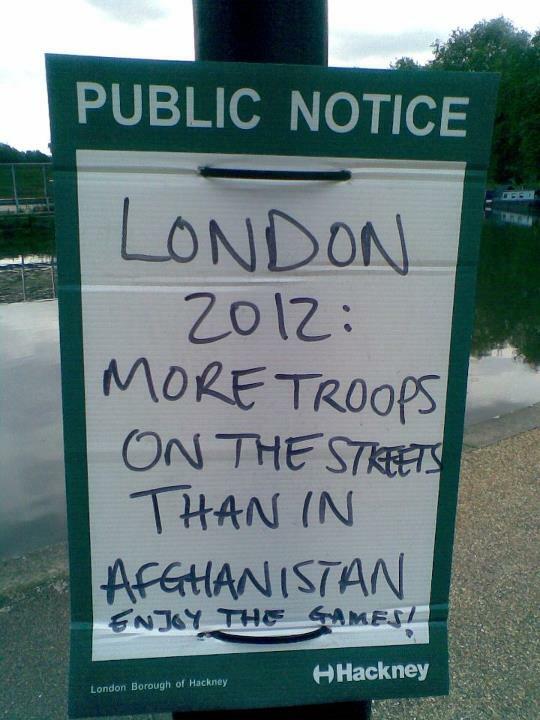 The fact that it has become illegal for people to put posters up in their own windows criticising the Olympics. (Where is that great defender of our civil liberties David Davis when you need him? Why hasn't he resigned and forced a by-election over this issue I wonder?) It's as if we have suddenly landed in a bizarre big-business ruled Stalinist state, the Olympic rings becoming a symbol of London not winning the Olympics, but sold to the IOC and the sponsors, chained to them, to McDonalds, Coca-Cola, Samsung and the rest. The Censorship Olympics, Corporate Lockdown London, to quote tags coined by writers other than myself. 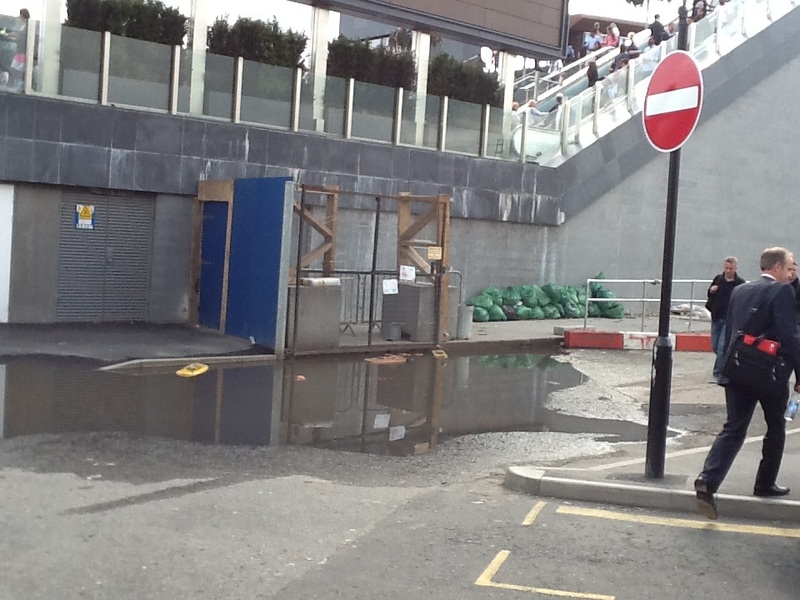 Did London win the Olympics or the Olympics win London? It's good to see that some ordinary people are standing up against this undemocratic, militaristic, corporatist machine that has sucked so much enthusiasm away from what could have been a great event for Britain and for London. 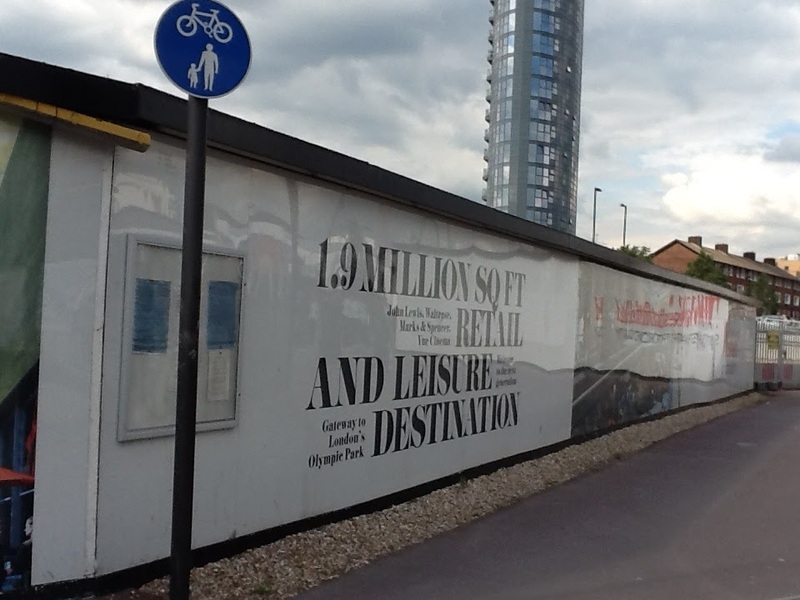 It's only a small campaign, over an apparently minor issue, a towpath a couple of metres wide running alongside the Olympic Park, but it's worthwhile and it's important. 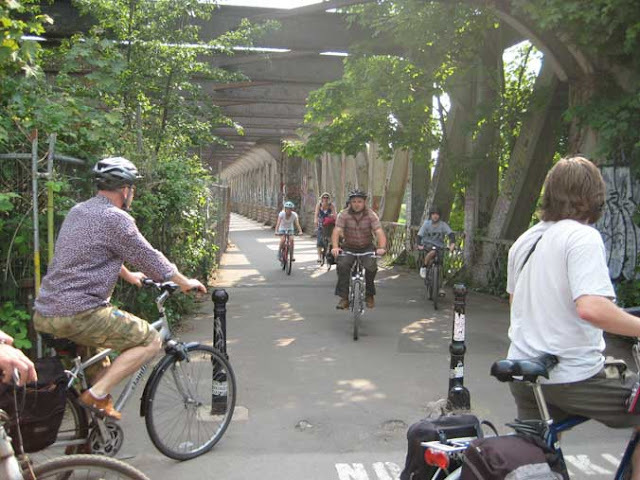 At the London Assembly debate on cycling on Thursday, on which I have already reported, one lady spoke from the floor about how the closure of the Lea Valley towpath had made the bike journey she used to regularly make with her kids impossible. How could she take them via the only alternative route, through the deadly Bow roundabout that claimed the lives of two cyclists last year? Did the powers who decided this have the slightest idea of how it would affect the lives of her and many other east Londoners? Do they not realise this is like closing the A12 for them? 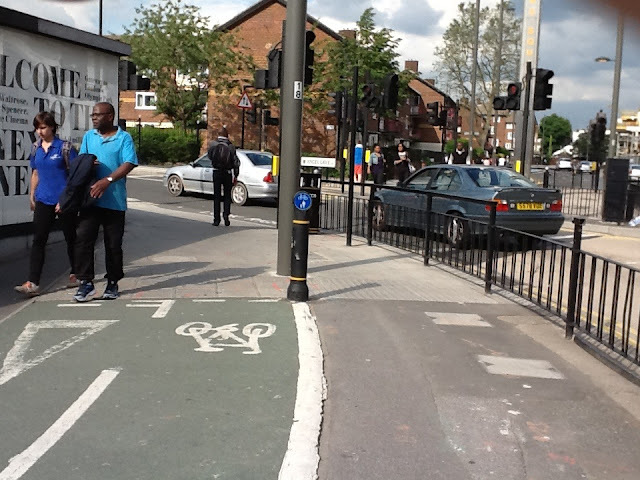 Why do walkers and cyclists have no rights to a safe place? She made a moving speech at the end of which she was almost in tears. Enough people are angry about the towpath closure, two weeks before the games even begin (and it will still be closed long after they are ended) for there now to be a campaign to Open Our Towpath. Fifty people turned out to the first protest on 8 July, and far more are likely for the next one, which is tomorrow, Sunday 15 July at 11:30, starting from the car park of the Princess of Wales Pub in Lea Bridge Road E5. The message is getting spread widely via a Facebook group, Twitter, and blogs, and some politicians are starting to listen and make sympathetic noises. I don't give much for the chances of success against the insane Olympic security paranoia juggernaut, but I think it's good that people are protesting against it. If you can make it, do go along and add your voice. 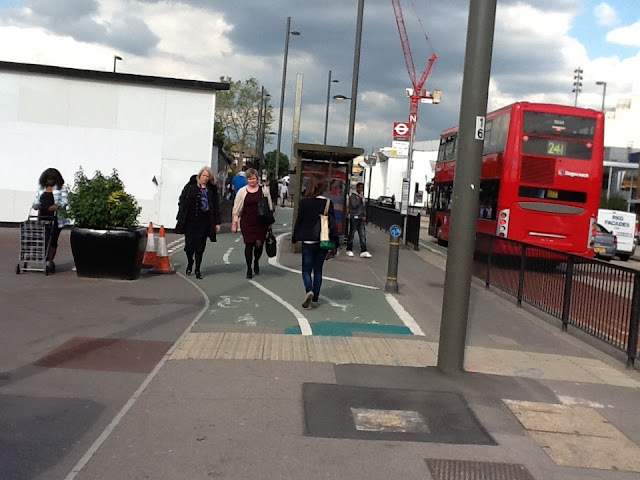 On Thursday I attended the session of the London Assembly Transport Committee on cycle safety. Some of the things I and another Cycling Embassy of Great Britain member, Tim Lennon, said in the debate have been reported here. I won't give a general account of the debate, in which representatives of London Cycling Campaign, British Cycling, CTC and Sustrans all said some very good things which I hope will find their way into the committee's ultimate report, and influence the Mayor and Transport for London. But I will mention the opinions of one Richmond councillor, their "Cycling Champion", no less, Conservative Katherine Harborne, and I will put here, in more detail, the response that I gave to her in the debate, and this will inevitably lead me into a discussion, again, of the danger of cycling in the UK. I broach this subject again not because I wish to dwell on bad things, but because I believe, and have believed for a long time, that realism on this subject is critical to generating the environment of honest debate that must be the necessary foundation for a real political movement to restore cycling to the major component of our transport system that it once was, and needs to become again, if we are to deal with the environmental challenges of the very near future, of which the greatest is probably global warming. Katharine Harborne is the Cycling Czar for the London Borough of Richmond, where she is also a councillor. “We have no family car and never have,” she says. “Cycling gives freedom to me and my family – and keeps me fit. My teenage son is working to get on the Olympic cycling programme. 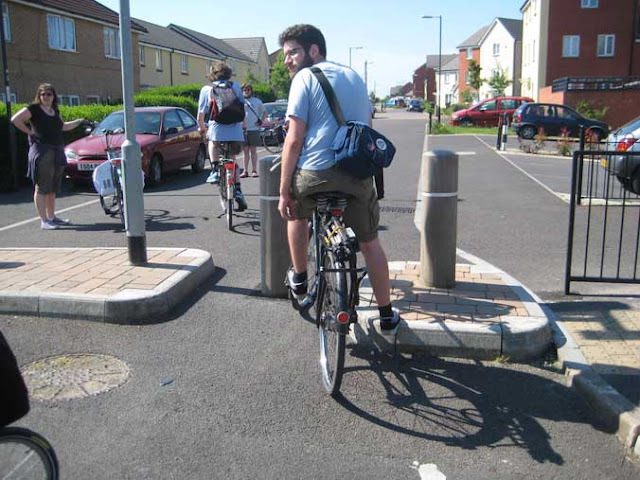 “But we are still some way from getting cycling accepted – and more people on their bikes. In fact research from British Cycling found that nearly a million women would like to start riding a bike, but many are put off by safety concerns. “Despite millions of pounds being spent making our roads from 2009-2011 less dangerous, safety fears have in fact increased by half in that period. “A 2011 report reveals that almost half [48%] of occasional cyclists think safety is a big issue and yet less than a quarter [23%] of regular cyclists think it is. “So if we want to encourage more people to cycle maybe we should stop going on about how dangerous it is because, frankly, it isn’t and we’re just putting people off. “Making London more cycle-friendly isn’t just about cycling superhighways or giving tipper trucks and skip lorries a lot of respect at junctions – 24% of people who commute in London could cycle, but don’t. Lets forget about the funny business at the end of proposing that lack of shower facilities is a reason why our children, parents and neighbours don't cycle on London's roads. Does anyone think that every Dutch or Danish person who takes a 2 km bike trip at 15 km/h in their normal clothes on their sit-up-and-beg bike has a shower at the end of it? Other politicians who have told us in recent times that "Cycling is not dangerous" are transport ministers Norman Baker and Mike Penning, as I reported in a previous post on a session of the Commons Transport Select Committee, at which they grievously misused statistics to try to suggest, incredibly, that the UK is doing a good job on cycle safety, better even than the Dutch. The link just quoted, to Jim Gleeson's statistics blog (Drawing) Rings Around The World, gives the truth of the matter, that cycling in the Netherlands is more than twice as safe per km travelled than cycling in the UK as measured from the official KSI statistics (Killed and Seriously Injured) issued by the two governments. But there is far more to it than this, as Jim Gleeson's subsequent post showed. For cycling is so widespread across all age-groups in the Netherlands that a very significant number of the KSIs in that country categorised as cycling casualties are one-person incidents: basically, as I mentioned once before on this blog, Dutch cycling conditions are so safe that an awful lot of elderly Dutch people just drop dead on their bikes, or have crashes causing injury that involve no other vehicle, and these are in the statistics. We really need to look, as Jim Gleeson does, at the rates, per km travelled, of death and serious injury of cyclists who are in collision with a motor vehicle to properly assess the safety records of the two countries, in regards how it should influence decision-making on street engineering and the segregation of bikes and cars. When we do this, the results are astounding. There are 508 KSIs involving motor vehicles per billion km cycled in the UK, compared with 61 in the Netherlands, a ratio of 8.3. Cycling, in regards interactions with motor vehicles, is really 8.3 times safer in the Netherlands. Their record is not just better, it is fantastically better. And fantastically better with a far wider demographic cycling, including large numbers of old, frail people who are far more likely to be killed or injured as a result of a given impact with a motor vehicle, or the ground, than the young, fit people who make up most of the British cycling demographic. And, one also might note, these are just the people, along with children, who could not be expected to mitigate danger in a purely vehicular cycling environment (that is, space shared with fast motor traffic) by cycling fast and assertively in Cyclecraft-recommended manner. So the Dutch cycling safety space is clearly a different world to that of the UK. Apart from comparing cycle safety between different countries, which represents a contrast that will not actually be felt by British people unless they actually try to cycle in those countries and here as well, we can also compare safety of different transport modes within the UK, describing a contrast that they can feel, and react to, on a daily basis, in making their decisions on transport mode. In the Department for Transport's Annual Report on road casualties for Great Britain 2009 (the last year for which full details are available) we discover (Table 1g) that the rate of cycle casualties (KSI) in that year was 880 per billion vehicle miles. In Table 1i we find that the rate of car user casualties (KSI) was 45 per billion vehicle miles. 880/45=19.55. Note that these are figures per billion vehicle miles, not person miles. Because average car occupancy is greater than 1, the rate per occupant is lowered, while for bikes the vehicle mile figure is the person mile figure. UK average car occupancy is 1.6. Therefore the danger ratio per person mile, bikes to cars, was in 2009 about 31. It's about 30 times more dangerous per mile to cycle than to travel by car in the UK. Half of all car journeys in Outer London are less than two miles in length, equating to a journey of about 10 minutes by bike. So there's the suggestion that people in general should be perfectly happy and willing just to swap the car for the bike for all these many short journeys they do. That's telling people not to live their lives in a different way, travel less or do anything else differently, that's just telling them to go on doing exactly all the things that they are doing now, but to use a mode of transport that is 30 times more dangerous than the one they are using! Telling them just increase their risk of death or serious injury on the road, by their own choice, their own actions, by a not insignificant factor of 30! I don't think that makes sense, frankly. I think that's treating people as idiots, as I said in the London Assembly debate. People are just not going to respond to this message. They are not going to cycle under current conditions unless they really want to cycle, or they really have to (e.g. for financial reasons), and if they really want to cycle, because they love cycling, and thus can put up with the risk, they will be doing it already. But if people with some power like Cllr Harborne stop telling people cycling is "safe", and instead do more to make it safer, then more people will give it a go, even though it will never, judging from the Dutch experience, be as safe as travelling in a car. (And the Dutch have really tried, big-time, to make cycling "safe", reducing the cycling to driving casualty ratio per km to 3.5.) Cllr Harborne, bear in mind, is she who was dismissive of the need for wider 20 mph zones in Richmond in a letter to Richmond Cycling Campaign least year. If we are to ever make progress on this, I think the advocates of cycling need to stop treating the public like idiots who cannot correctly judge what is or is not an unacceptably dangerous activity for them to engage in. I think they can judge. I think those for whom cycling would be massively dangerous under current conditions generally make a correct judgement not to do it, and even for those who judge that it is not unacceptably dangerous, it's still far more dangerous than doing the same journey by car, and their doing it at all depends on their sense of enjoyment, judgement of convenience, and sometimes, a financial incentive. Only motorcycling is significantly more dangerous per mile than cycling (about 4 times). The danger of walking is comparable to that of cycling (Annual Report 2009 Chart 1e), but we expect journeys by foot to be shorter, and everybody walks, not a restricted demographic. Even in the current hostile traffic environment, the benefits gained from regular cycling [are] likely to outweigh the loss of life through cycling accidents for the population of regular cyclists. One calculation has shown the ratio to be around 20:1. I suspect there is a lot of uncertainty here, implied in the phrase "one calculation", as there would be a lot of factors to take into account. Would, for example, more cycling mean that people walked less? In any case, this has always struck me as a rather weak promotional argument. This is, in the first place, because it involves people thinking about remote imponderables in their lives. It involves them needing to agree to make an exchange of a very clear, tangible threat in the present, of getting knocked off a bike on the road, for a promised benefit in the far future which they may well not accept as being very real. They might argue "Well if I don't die of that, I'll probably die of something else soon after", or, more rationally, they might argue that they can, and prefer to, get exactly the same health benefit from another choice of exercise or strenuous activity, whether that be running, swimming, going to the gym, or gardening, without the risk or injury or death in traffic that comes with cycling. So I don't think trying to frighten people into taking up cycling with the threat of heart disease decades down the line gets as much traction as many would hope it might. The last of these is the only one we are really doing in the UK at the moment, and more by accident than design, with rising costs of fuel and public transport. I think this is the main factor that has been driving the modern increase in cycling in London. But if we get more people on bikes by this method, we get more deaths and injuries. As even Chris Peck of the CTC acknowledged at the Assembly debate, in the last couple of years, casualty increases have outstripped the increase in cycling, despite the CTC generally in the past having been rather fervent advocates of the "Safety in Numbers" theory. I don't think that's a great policy success. I want more people to cycle, for all the health and environmental and social benefits I think it would bring, but I don't want to go back to the 1930s situation, when we had plenty of cyclists on the streets (quite how many it is difficult to tell, as I have never seen any transport statistics for the pre-war period), and eleven were being killed every week in London, about 35 times the current death rate. I don't think non-cyclists are much influenced by how dangerous people like me or Cllr Harborne say cycling is or isn't. They do what they feel is sensible for them. No political movement ever gained any traction by telling the vast majority of the population that their basic, gut feelings about what they should do are wrong. We shouldn't expect anything different in respect of cycling. And even if that rule were proved false in this case, and the masses responded to Cllr Harbone's message (and those of others like her) and started cycling just because they are told they should, without other policy changes to make the roads safer for them, I don't think there would be any social or moral progress there, and it's not a thing with which I would want to be associated. I want more people to cycle because they really find it pleasurable, relaxing and safe, not because they are told they should, or are dragooned into it through lack of other affordable choice. OK, this is a bit embarrassing, but having announced that I would be continuing this blog on a different platform, WordPress, I have changed my mind and decided to continue it here. This requires some explanation. The main reasons for the attempt to transfer to WordPress were the fact that some people seemed to have great difficult commenting on Blogspot posts (and indeed the blogger commenting system has been quite poor in the past), and that creation of long blogposts on Blogger containing lots of pictures and captions is a bit of a nightmare. The formatting can, in my experience, never be got exactly right, the input system is subject to erratic behaviour (which seems particularly the case in posts containing a lot of images), and it takes much time continually previewing pages to see what you will actually get, and then switching back to the input window to make changes, which are often a matter of guesswork, as the input window is not truly WYSIWYG. I am not an expert on HTML, and I don't wan't to have be one. On the other hand I found that the process of importing a whole blog to WordPress was not without a lot of problems. Paragraphing went wrong, picture proportions went wrong, and a lot of problems had to be fixed. I went for the idea of hosting a blog on my own webspace, rather than using a free WordPress.com address, because there would be most control using this, and greatest security and reliability of backing-up. But I found this created many difficulties for which I was not prepared, and which I don't have the time or the inclination to solve. A self-hosted WordPress blog, I found, is not for those unfamiliar with coding and the technicalities of servers and Content Management Systems. Despite apparently "supporting" WordPress, I found my host was not in fact well set-up for it, and lots of features of the WordPress system could not be made to work, seemingly because of the type of server software they were using (Zeus, not Apache), or management decisions they had taken (blocking certain files critical to WordPress), and found I was spending all my time trying to understand the problems and research solutions and getting into technicalities in which I was simply not interested, as someone who just wants to write a blog. I got WordPress to work to a large extent, and found that, as a CMS, it is indeed in some ways better than Blogger. However, another factor was that, with a long history of posts on the old blog having been linked to by other people and indexed in search engines, and people following the blog, I continued to get far more hits in the old location than the new one even after the change was announced. Though this would probably change in the long term, it seems a pity to abandon that advantage and "goodwill". I found it was possible to set up a redirect on the voleospeed.blogspot sub-domain name, so it directed to the WordPress site, but it only directed to the top level of that site, and old links to articles, for example from search engine listings, were then broken, not linked either to the article in the new or the old location. So basically this all meant that people would, in the short term, have much more difficulty finding the blog, and it would get fewer hits, in exchange for marginal usability advantages for me, and, in addition, I still could not make the full WordPress system work on my server. And in some ways I just have found WordPress unnecessarily annoying: Like the way on the administration page it greets you with the word "Howdy" (which cannot be changed), and other pieces of inappropriate arch humour such as the fact that you get support from someone styling themselves a "Happiness Engineer", and you get a plug-in giving you lyrics from Hello, Dolly (why they heck??) when you set the system up. WordPress (the software rather than the .com site) is a crowd-sourced, public domain project, in a way admirable, but that also makes it seem like a big, messy, slightly amateurish bundle of different modules, plugins, and bits of code that have to be installed and taken away again and modified and delved into to make it work. It's not a contained, finished product, and you have to be interested in playing with it and tweaking it (or alternatively be paid for to do that), which I was not. So I've decided to go back to good ole' Google Blogger on Blogspot, which at least is straightforward to use, fairly neat, easily customisable, and doesn't require delving into code and having to understand the significance of a lot of files with obscure names on a server. The experience gained of dealing with WordPress might well be useful in the future in improving my other websites on astronomy and music. The domain name www.voleospeed.co.uk now redirects here, to www.voleospeed.blogspot.co.uk, and both these addresses should continue to work for art least the next two years. Thanks for your forbearance. Slightly revised version of a post previously published on my WordPress site. Comments could not be transferred, unfortunately. I am afraid I have not kept this blog much up to date with recent developments, though I have been busy attending things relevant to cycling: the Cycling Embassy AGM held in Bristol in May, the Cycling Cultures report launch at the University of East London, and meetings discussing the preliminary results of TfL's junction reviews. I will give some thoughts arising out of the first of these today. 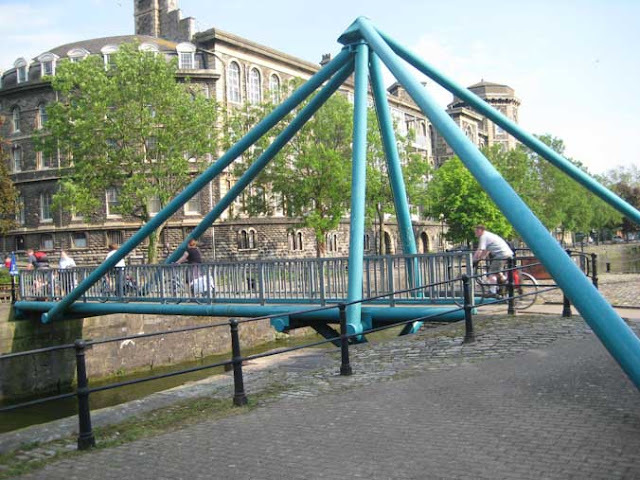 Despite having been born and brought up in the south-west quarter of England, I had never actually been to Bristol, and I had never seen the "flagship" National Cycle Network route, the Bristol to Bath bike path, so all this was very interesting. The Cycling Embassy group were shown not only the Bristol to Bath path, the full length of which we cycled, but also the work on the Two Tunnels cycle (and walking) route within Bath, which will, eventually, link the B2B path with new suburbs..
Cycling Embassy folk arrive at Bath on the one hot Saturday we have had his "summer"
Later in the day, after the AGM itself, we were shown around Bristol town centre by Steve Melia, who explained how the area had been change to favour walking and cycling in recent years, and went into proposals for further reducing motor traffic in the centre and the politics of this change. 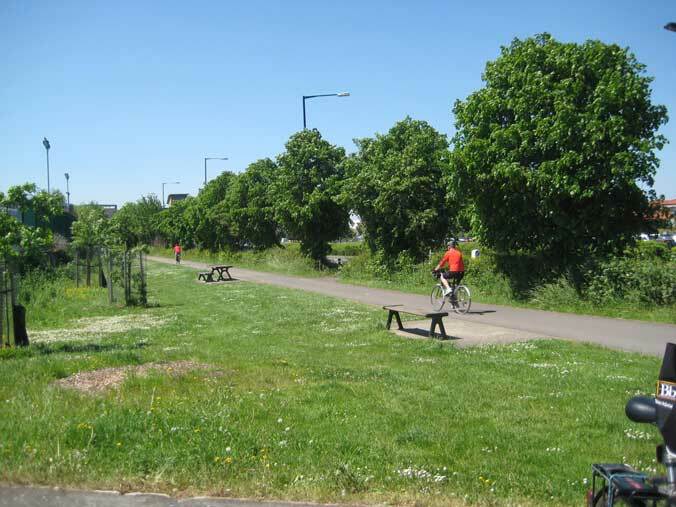 The meeting extended over a whole weekend, and on the Sunday there were two further bike trips round Bristol and its environs, both led by Joe Dunckley. 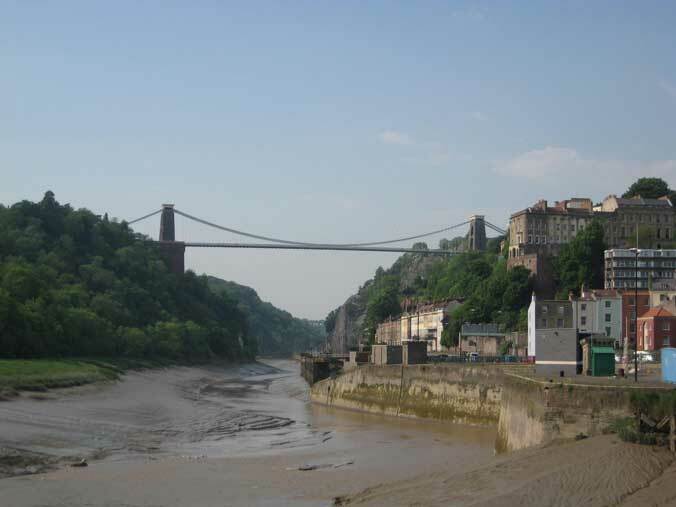 The first explored cycling conditions in the northern suburbs and some of the established and developing routes (other than the B2B path), and the second took us to some new places including scenic views of the Avon gorge. 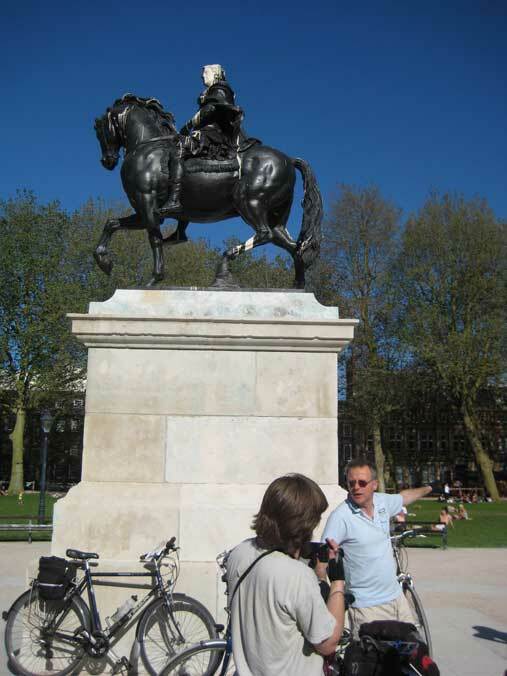 Having been clueless about Bristol's cycling credentials before, I was very impressed. Here was a town that does have some natural advantages in generating a cycling culture, such as a compact, historic centre and a large student population (though, as a proportion, nothing like as large as that of Cambridge, Oxford or York), but also some disadvantages: severe hills, severance by big roads, and suburban residential, commercial and industrial sprawl. 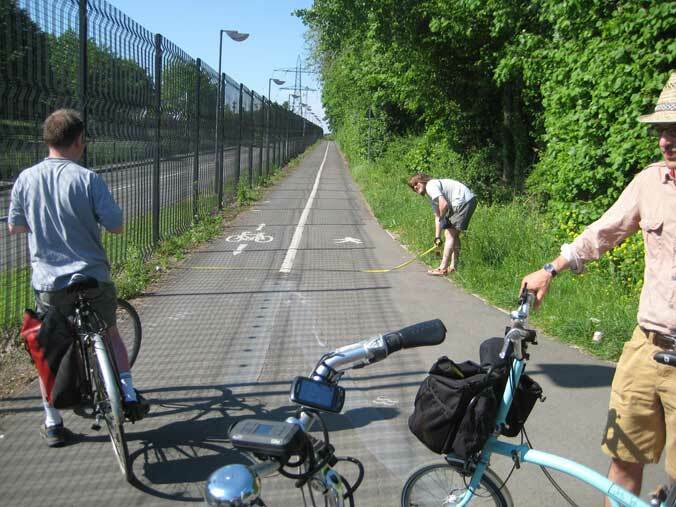 Yet the level of cycling was impressive, and the progress made and being made to facilitate that cycling through real and sometimes controversial infrastructure change not insubstantial. 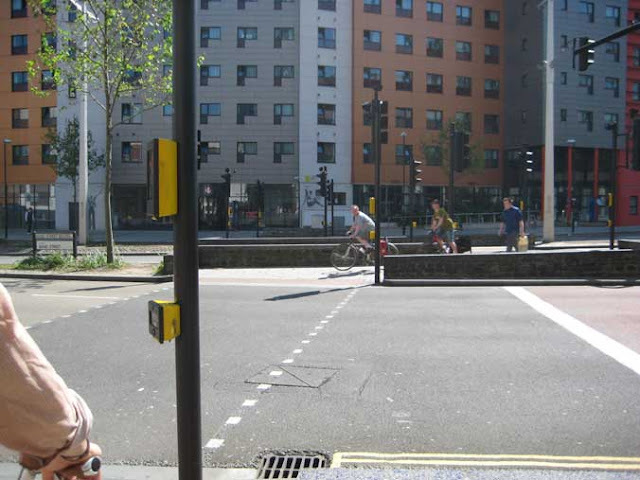 Not particularly smart or expensively-designed, but this is Shared Space in Bristol that is genuinely shared because most motor traffic has been excluded. 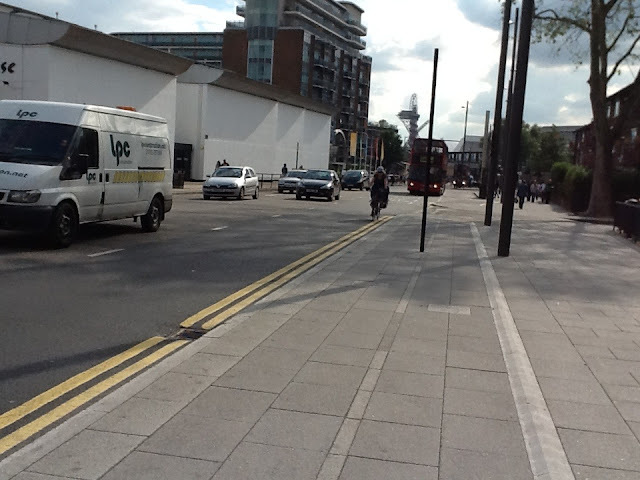 Contrast with London's failed Exhibition Road scheme. If Bristol had the student proportion that Cambridge or even York has (which it could not have as it is a bigger, more diverse place, I am sure if would be far and away the leading cycling city in the UK. It may justifiably make that claim even now. For the basic fact about Cambridge is that relatively poor infrastructure there is trumped by the fact that the students literally have no other possible way of getting around. They are not allowed to own cars: a long-standing agreement between the university and city council ensures this. No other city could replicate this situation. 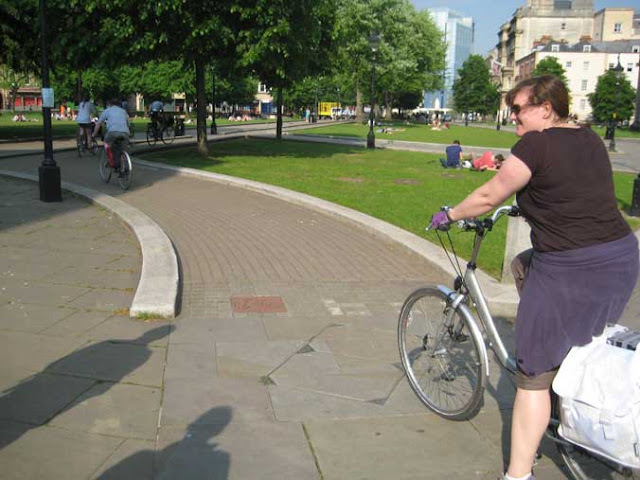 The cycling level is high in Bristol, despite the hills, because the cycling infrastructure is the best in the UK. By "cycling infrastructure", I mean this to be taken in a broad way: not just specific bike paths and lanes, though these make a significant contribution, but also the measures that have been taken to control motor traffic both in the centre and in some suburban areas. We tend to regard the "centre of gravity" of cycling in the UK as being in the east: well-known cycling places are London, Cambridge, Peterborough, York and Edinburgh. 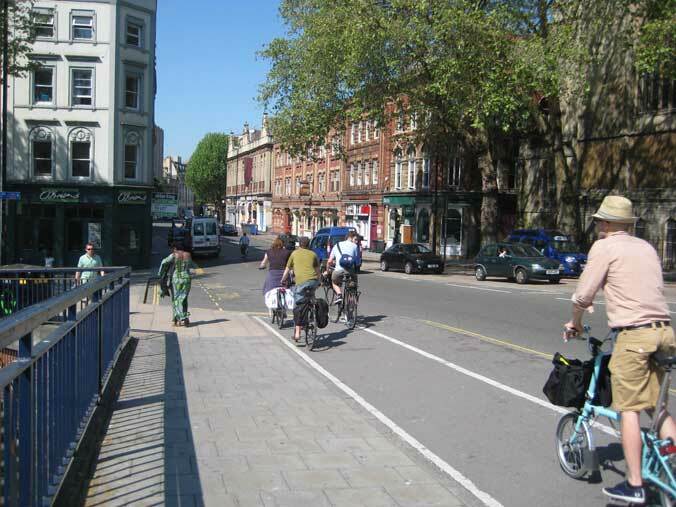 But towns and cities wishing to become more cycle-friendly probably should look at Bristol more than any of these. Britain's cycling centre of gravity is here, in the west. 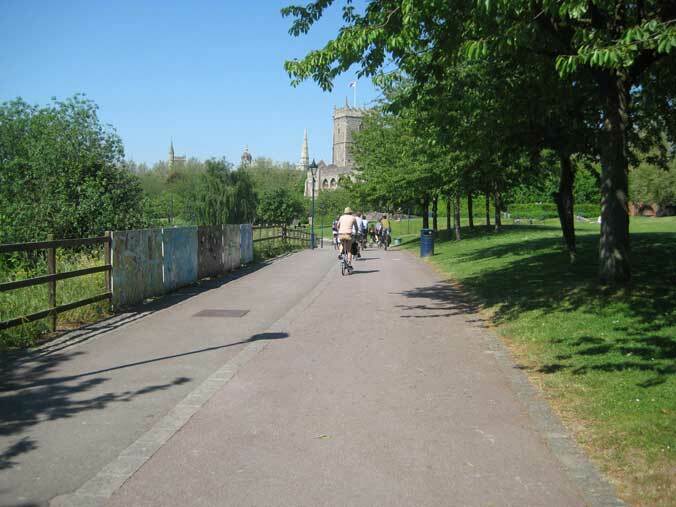 Bath is fairly cycle-unfriendly at the moment; the B2B path is not satisfactorily connected to the town centre, the riverside path that is supposed to have that function being far too narrow, and the on-road alternatives hostile. 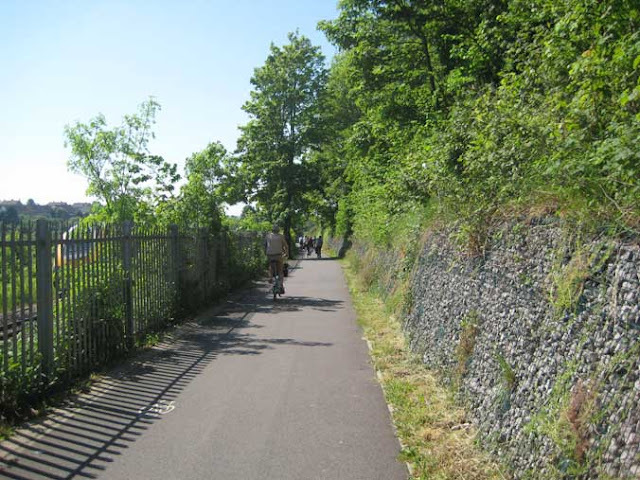 But the local authority is progressive and with Sustrans is working hard, and it looks like the Two Tunnels Greenway will be a huge breakthrough. 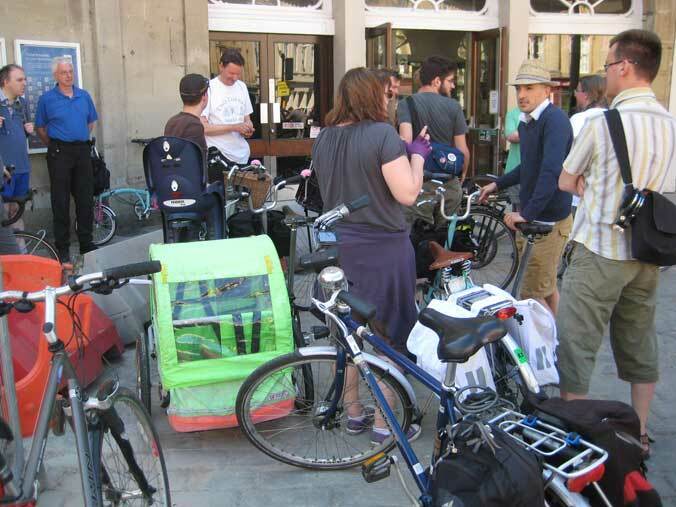 Even without a good connection to Bath town centre, the Bristol to Bath path is absolutely at capacity, and urgently needs to be widened (or have alternative routes built to take some of the pressure off). 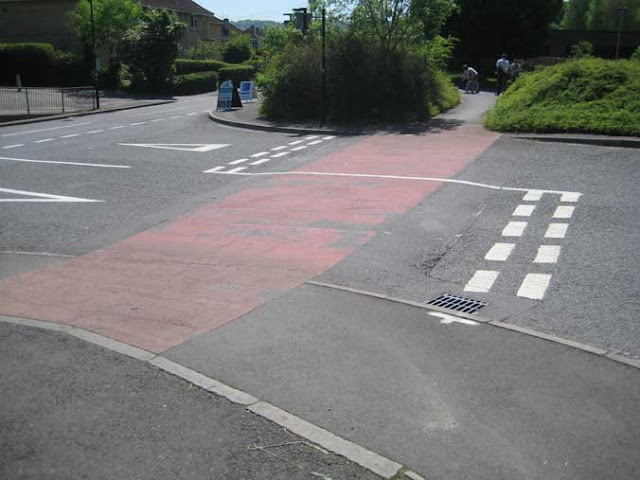 We were accompanied on the ride on the path by a Bath councillor, the city's "Cycling Champion", and he recognised this. The path is a victim of its own success, and is generating the need for more investment on cycling infrastructure elsewhere. He made the legitimate point that, due to shortage of available funds, it was hard to decide whether the existing path should be improved or developments made elsewhere. This is not a choice that really should have to be made. The Bristol-Bath path is making a huge contribution to tourism, transport and leisure of people of all ages and walks of life in the area, and that success should be built on. 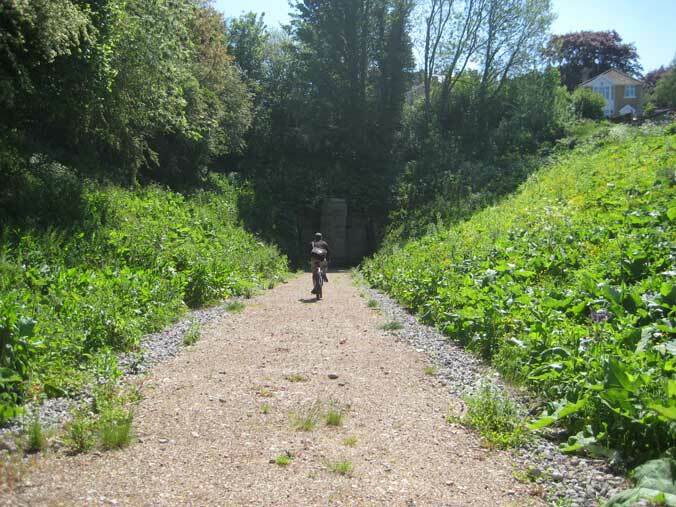 It is typically 3 metres wide, but, as Joe Dunckley pointed out, the whole line of the railway bed is far wider, and in most places it could be widened to 4 or 5 metres at least. There is the problem that the railway is, for a distance between Bristol and Bath, still in place on a single track, operated by steam enthusiasts. Neither the path, nor the railway, can ever be all that satisfactory on this stretch with the other present. This is a conflict that I have seen elsewhere on NCN paths in the UK (in Norfolk). 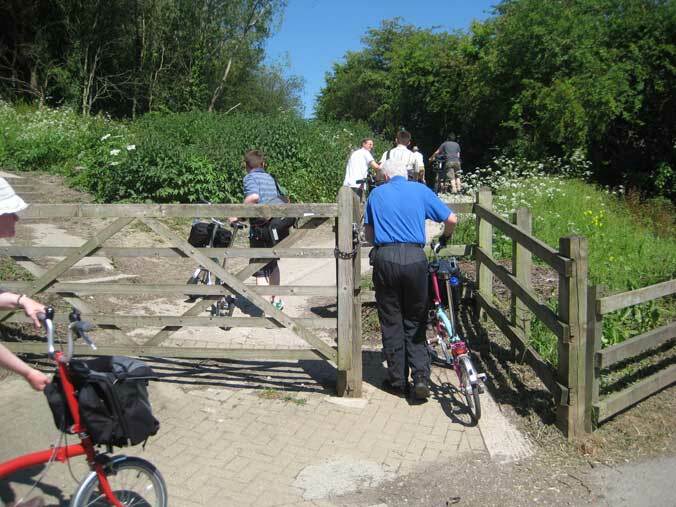 It comes from the fact that we have been relying on these disused railway alignments as our only serious source of land for inter-town cycle paths, and they are a resource in very short supply. We should be instead thinking about doing what the Dutch do: local authorities there can, and do constantly, acquire land for new cycle paths that are unrelated to the road network, and so suffer no environmental influence from traffic. There is an immense demand for these routes, and the supply, at the moment, is pathetic. This is why, when one path, the Bristol to Bath one, is done reasonably well (though to nothing like Dutch standards of quality), all the world and his wife and their family and dog and horse come to use it. Where the B2B path enters the suburbs of Bristol, it does not conk out or divert onto minor roads or collide with cycle-unfriendly traffic systems, as do most off-road cycle paths in the UK when entering urban areas. 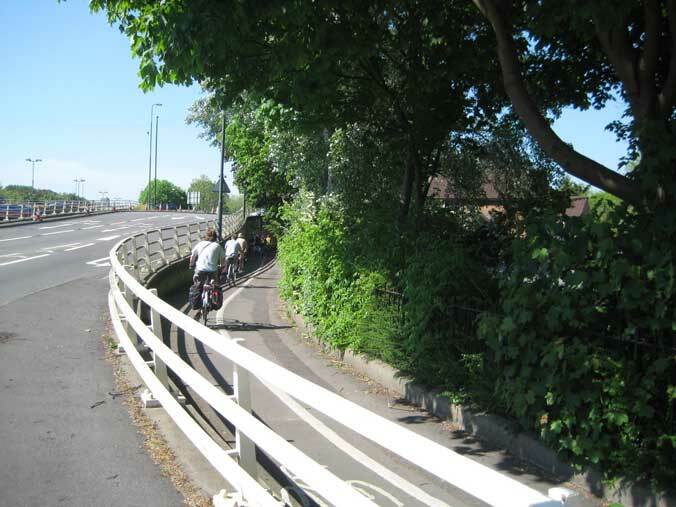 It is carried over motorways and roundabouts on bridges that almost made me feel I was back in the Netherlands, where, of course, high-level engineering totally separating cycle flows from motor traffic is the norm. 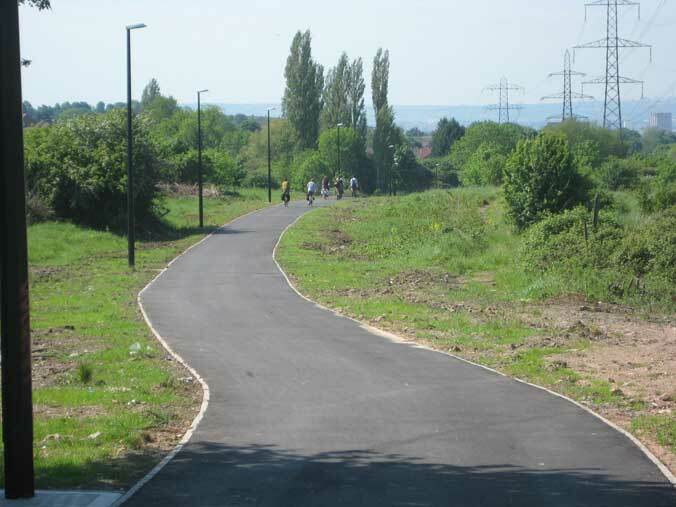 The original line of the railway did not go properly to Bristol city centre, but new links have now been created within the city to allow you to cycle, traffic, free, all the way there. And when you get to Bristol city centre, there are extensive almost traffic-tree spaces to cycle around in. Bristol waterfront: a little bit "Dutch"
One of the biggest and most commendable roll-backs ever of inappropriate motor invasion of a historic city centre in the UK took place in Bristol in 2000 when the Inner Circuit Road, driven diagonally across Queen Square in 1937, was removed, and the square restored to its peaceful, Georgian grandeur, a place for sunbathers, walkers and cyclists, with the occasional delivery by van allowed. This massive change is a signal one to give encouragement to those who believe it is possible to improve our cities and actually make big, popular changes that involve removing traffic. 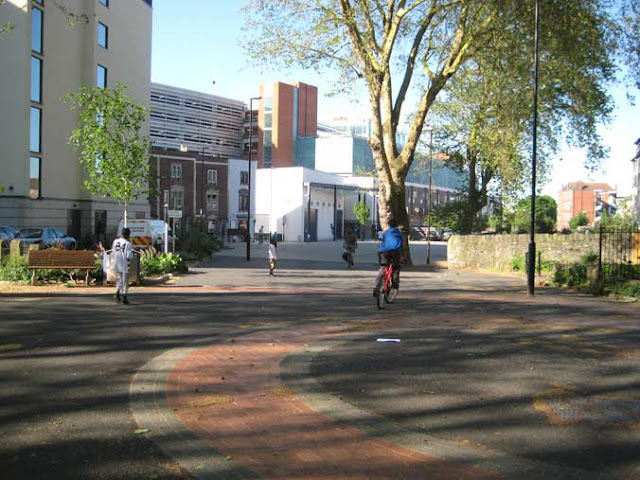 There was great opposition to the removal of the Inner Circuit Road at time, but now nobody in Bristol would have it back in Queen Square. And I suspect this change in modern times had a wider effect on the psychology of the city, and put in train a desire to change even more in the environment for the benefit of people not travelling in space-wasting metal boxes, a realisation that radical things can be done, that has led to the subsequent improvements to the city centre, and development of some decent (by UK standards) mostly traffic-free routes to the suburbs. Steve Melia indicates the route of a huge road through Bristol's Regency centre prior to the restoration of Queen Square in 2000. The statue is George III by Rysbrack (1733). Bristol is certainly not a miniature Amsterdam or Copenhagen (though in places it does resemble them). The standard of the cycle panning and engineering is far off what the Dutch would consider acceptable, and there are still far too many main road barriers, poor crossings, nasty junctions, built-in pedestrian/cycle conflicts, and other issues arising from car-centric planning of the past. But compared to the Borough of Brent it is a bit of paradise. 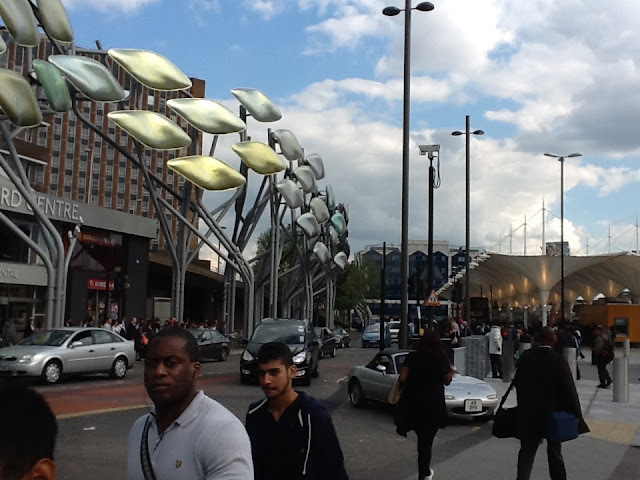 And it is moving visible in the right direction, whereas the London suburbs (with the exception of odd projects like the Olympic Park, which haven't helped cycling either) seem to be set in concrete at Epoch 1970.0, the changes required being so vast that no London borough can contemplate the expenditure that is necessary. Cycle route on a nice new estate at the Bristol Council–South Gloucestershire border foolishly obstructed by a wooden post. It would never occur to me to suggest that this problem could easily be remedied by a couple of men with a hand saw in the dead of night. 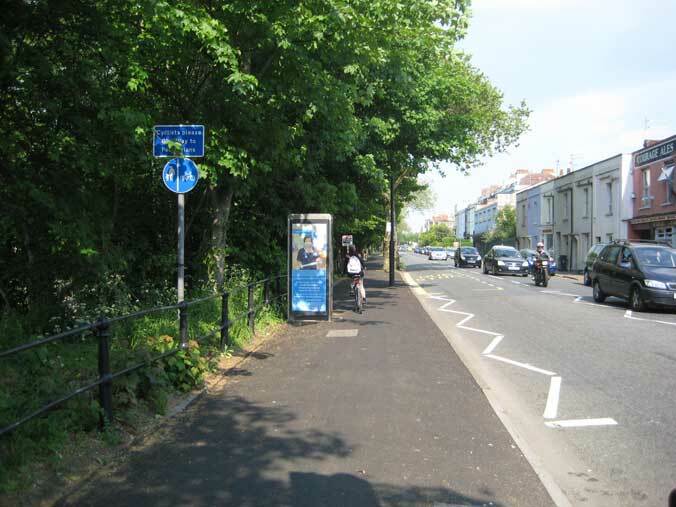 This is not a cycle path, it is just a pavement. Shared use is generally not appropriate in towns. Near Bristol Cathedral: not too bad a cycle path, but again, to my mind, too much confusion between cycle and pedestrian space in a small area, too much subtlety with the tiny red cycle symbol tile, and a silly (worn-out) "Give-way". The main purpose if the Cycling Embassy AGM was to decide the direction and strategy of the organisation after its first year of existence, which was devoted mainly to explaining to the world why it should exist at all. Many people have asked me, "Why another cycling organisation in the UK? ", but I have not the slightest doubt that the setting-up of the Cycling Embassy of Great Britain was necessary, and, indeed, a long overdue step. The reason was that the UK needed a pressure group to demand, on a national basis, the type of high-quality dedicated cycle infrastructure that is the necessary prerequisite of a mass cycling culture. The existing cycling organisations were not doing this. They were doing many other good things, representing their members, providing services to them, and organising training, and acting as suppliers of services to government, but not this. Or if they were, it was a too low-key and mixed-up message to work. 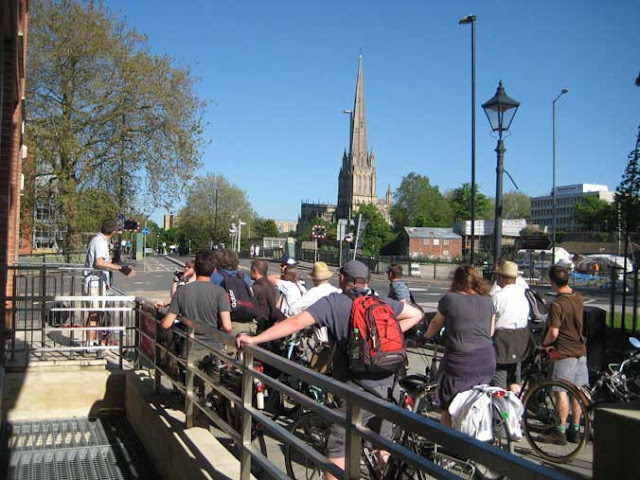 We needed a body that shouted a single, clear, unambiguous message about cycling "from the rooftops": Mass cycling as transport ain't going to happen in the UK without proper cycle paths and tracks everywhere, in the city, suburbs and countryside. There was some overlap between the objectives of the Embassy and Sustrans, the great charity responsible for the B2B path and other elements of the National Cycle Network, but they were and are primarily a provider of a practical service involving the organisation of volunteers, not primarily a political lobby group, and also, as recipients of large amounts of public (or lottery) money, they could not be regarded as a fully independent force. Also, I think it is fair to say that the founders of the Embassy regarded Sustrans' apparent collective concept of the nature of the cycle infrastructure that the UK required to be inadequate. We felt there needed to be a voice that was (in a friendly, constructive way) critical of Sustrans and of inadequate demands by other cycling organisations. So that was what the Embassy was about, but what sort of organisation should it be? A membership organisation, a pressure group, a think-tank, or a political lobby? This was debated at this AGM. It was decided that the Embassy should not a membership organisation. It was decided that there is no need for another organisation to compete with CTC and British Cycling to be a provider of benefits (such as insurance) to individual cyclists in return for a membership fee. These organisations do a good job. The Embassy also, it was decided, does not have the resources to be a consultee on whatever problems or schemes need addressing for cycling on a local basis across the country, though we do with to supply good information to local campaigning groups, who are the proper people to advise local authorities as to what needs doing in their areas. The Embassy, it was decided, should free itself primarily to be the national lobby directed at central government (Westminster and the devolved administrations) for asatisfactory policy, legal backing, and funding for building cycling through provision of cycle-specific infrastructure across the UK, based on best-practice from what has been proven to work in other countries. The Embassy would be a network of supporters who all shared the vision of mass cycling on quality separated infrastructure, with all the huge economic, social and health benefits for the nation we believe that would bring. With a large support base, pledged to support a clear manifesto, it would be possible to go to central government and say "This is what X thousand people think on this subject. What are you going to do about it?" This is the point. For too long (almost the whole period of the invention of the bicycle, in fact, the British government has failed to provide a lead on how the bike should be accommodated in our country. We have been watching and discussing the successful pro-bike policies of some of our continental neighbours, particularly, of course, the Netherlands, for 80 years, wondering whether or not they could work here, while continuing, in practice, to design-out the bike from our urban and rural environments so comprehensively that the vast majority of the population consider it totally out of the question to attemp to meet the daily transport needs by cycling. In each decade, in each generation, and in each parliament, ministers of transport have insisted that it is "the responsibility of local authorities" to provide for cycling, without giving them the direction, the legislative backing, the powers and the funding to do it. If this attitude had been taken in respect of the nation's railways, its ports, motorways and airports, we would have none – as we have (with precious few exceptions like the B2B path) no effective cycle infrastructure. We need a change that has to come from the top. 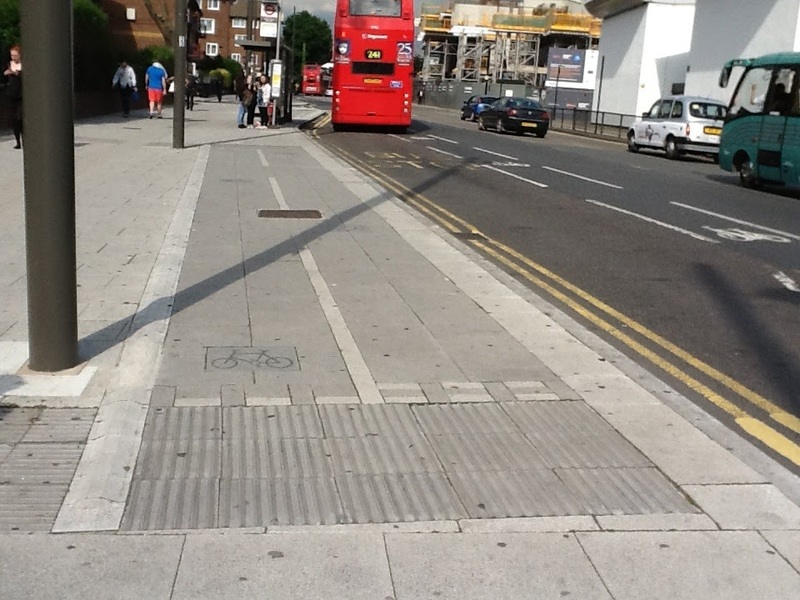 Getting this is the huge task that the Cycling Embassy of Great Britain has set itself. 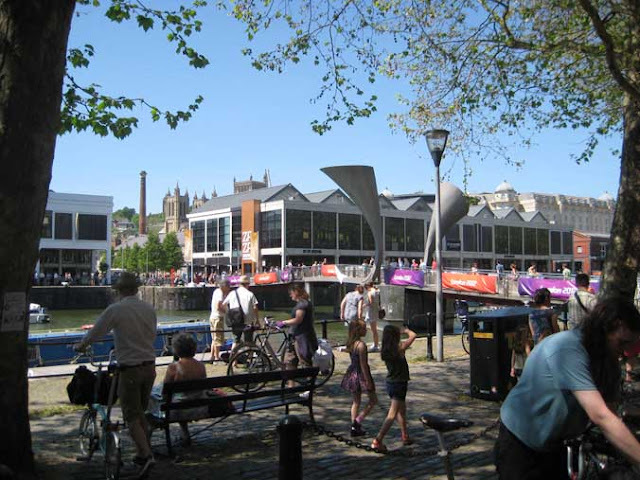 Every town, city and rural district in the UK needs to have what Bristol has, but far more, and better, and that won't happen until central government has said loud and clear that this is what they want and provided the cash, freedom and expertise to local authorities to make it happen. That will mean ending the long British tradition of treating cycling as some sort of toy or diversion, but reassessing it thoroughly as universal efficient mass transport for medium-length daily journeys and part of the core infrastructure requirements of a modern advanced nation, on a par with motor, rail, air and sea infrastructure. It's a long way off. But in Bristol, Bath, and other places, many people are working towards this goal, and, little, by little, in places, it is becoming a reality, and then other places can see how it is done. 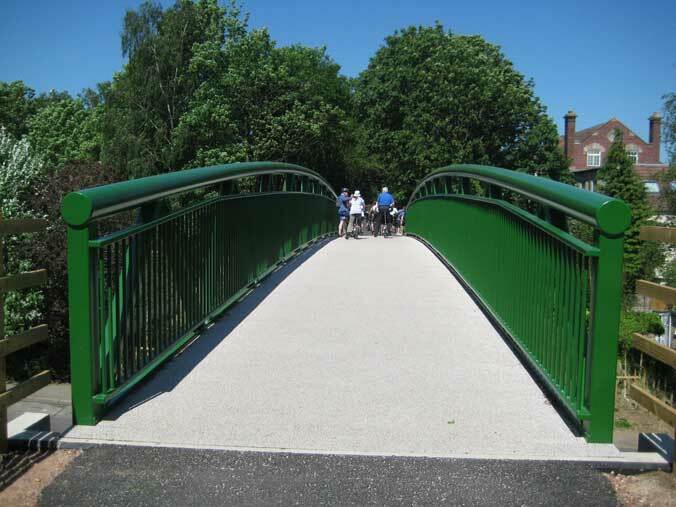 Brighton (with its Green Party council) has taken the latest substantial step with a high-quality cycle track on Old Shoreham Road that looks as if it will be genuinely useful to many cyclists. As more good examples of working dedicated cycle infrastructure appear around the country, other towns will want the same, and, with the correct policies from central government, a momentum will develop that has the potential to transform the appearance of our towns and the nature of local transport across the UK. The Cycling Embassy is organising an Infrastructure Safari on bikes for campaigners, planners, politicians, and anyone interested to see what has been achieved in Brighton and Worthing on Saturday 18 August. Sign up to the Embassy (if you have not already done so) to be kept informed, and put the date in your diary. And if you think the Embassy should come and look at cycling developments in your town, then tell us. Don't forget also that the Embassy is organising another study tour party with David Hembrow in Assen, Netherlands, in September. If you want to understand what it is really all about, what the Embassy is actually aiming at, this is the one "must-do" activity. You will see how riding a bike becomes really "as easy as riding a bike" in the correct environment, and why we urgently need this in the UK. We've been discussing this for 80 years. We shouldn't loose any more time. Sorry for the trouble, but if you have links, please update them to the new address. The archive of the blog on Blogger will remain here, but new posts will be added to the new site, which also has the archive. Thank you for reading. The Vole O'Speed blog on Blogger achieved more than 100,000 hits in just over a year of activity, May 2011 to June 2012.